If you are eager to dive into a deeper experience and learn more about yoga, movement, meditation or personal development, then our Workshop and Master Classes here are ideal for you! These are longer format learning and practice experiences lead by Yoga Barn teachers as well as some of the best visiting international teachers. For a sound-healing, musical and community experience, check out our Night Events here featuring Gong Baths, Tibetan Bowl Meditations, Cacao Ceremonies, concerts, parties or other special community gatherings. We also offer bi-weekly Monday Movie Nights where we feature some great documentaries. Workshops and Events can be booked online so you can be sure to get a spot and save with Early Bird discounts. Click on "Book Here" buttons below or check here if you need step-by-step instructions for the booking process. Alternatively, you can book on site at our Reception. Please note, online bookings will end 2 hours before the start time but you can still register for the workshop at reception at The Yoga Barn. 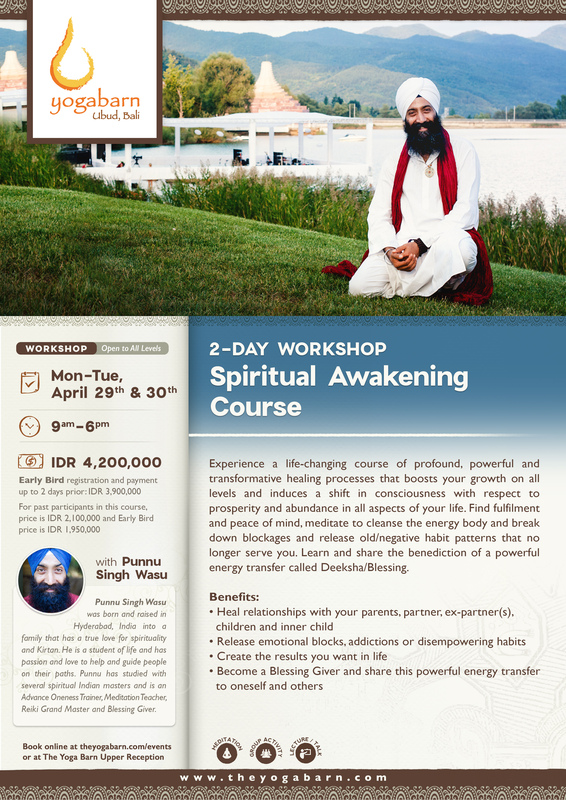 Early Bird registration and payment up to 2 days prior: IDR 3,900,000. 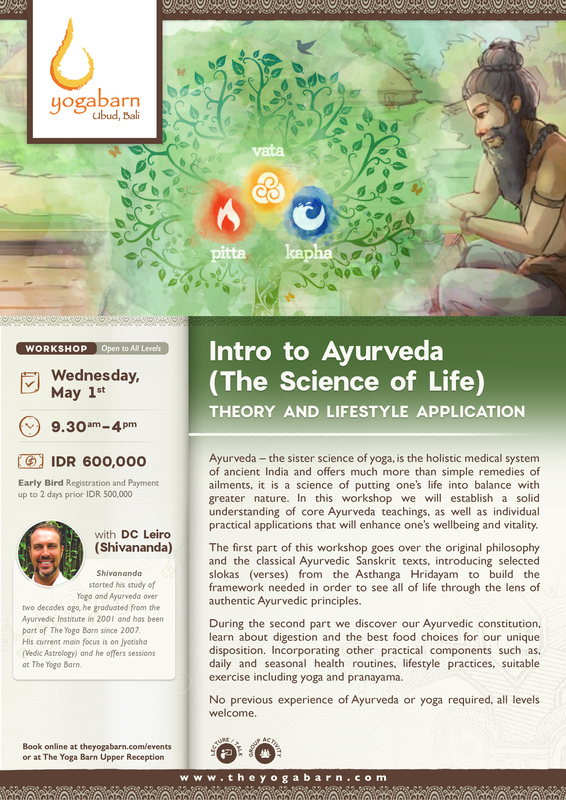 Ayurveda – the sister science of yoga, is the holistic medical system of ancient India and offers much more than simple remedies of ailments, it’s a science of putting one’s life into balance with greater nature. In this workshop we will establish a solid understanding of core Ayurveda teachings, as well as individual practical applications that will enhance one’s wellbeing and vitality. The first part of this workshop goes over the original philosophy and the classical Ayurvedic Sanskrit texts, introducing selected slokas (verses) from the Asthanga Hridayam to build the framework needed in order to see all of life through the lens of authentic Ayurvedic principles. During the second part we discover our Ayurvedic constitution, learn about digestion and the best food choices for our unique disposition. Incorporating other practical components such as, daily and seasonal health routines, lifestyle practices, suitable exercise including yoga and pranayama. 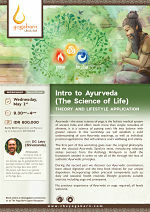 No previous experience of Ayurveda or yoga required, all levels welcome. Shivananda started his study of Yoga and Ayurveda over two decades ago, he graduated from the Ayurvedic Institute in 2001 and has been part of The Yoga Barn since 2007. His current main focus is on Jyotisha (Vedic astrology) and he offers sessions at The Yoga Barn. This is great for people who have been practicing yoga for a while and are ready to confront the fear of going upside down. 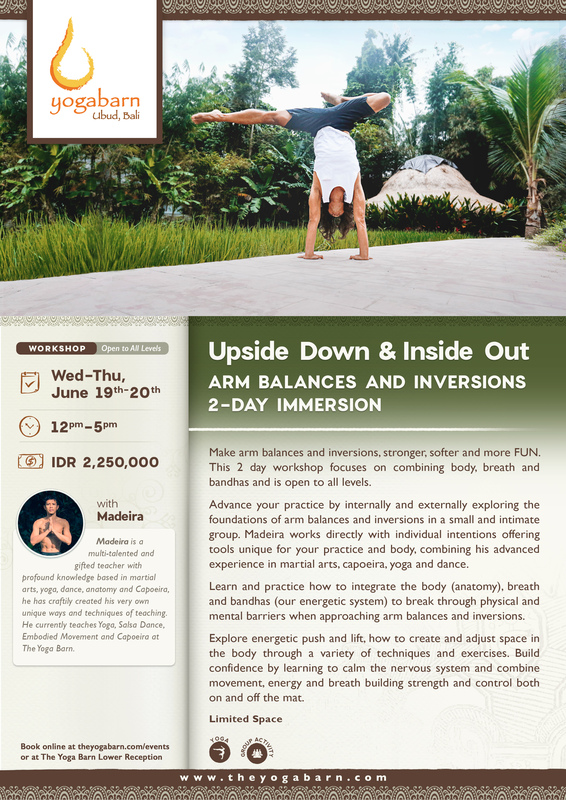 It’s also an awesome workshop for yogis that have learned inversions on their own and are looking to refine them as well as for those ready to move away from the wall. Open to all, fasten your seatbelt, and get ready to FLY! Paul Teodo is a yoga, meditation teacher and musician originally from Los Angeles, CA. Prior to coming to The Yoga Barn, Paul was teaching for 4 years at Bryan Kest’s Power Yoga Studio in Santa Monica, the world’s original donation-based yoga studio. He was also a senior teacher at the Yoga Collective in Venice Beach and Unplug Meditation. Paul was recently named the #1 Yoga Teacher in Los Angeles by the Culture Trip. Paul has spent the last 6 years perfecting A Journey to Center, his own personal combination of a mindfulness meditation combined with original pieces written on acoustic guitar. His debut album was released on iTunes and BandCamp. Expand your relationship with gravity...and with people! Anyone who is open to a fun exploration of movement and connection will find opportunity to grow in this workshop. 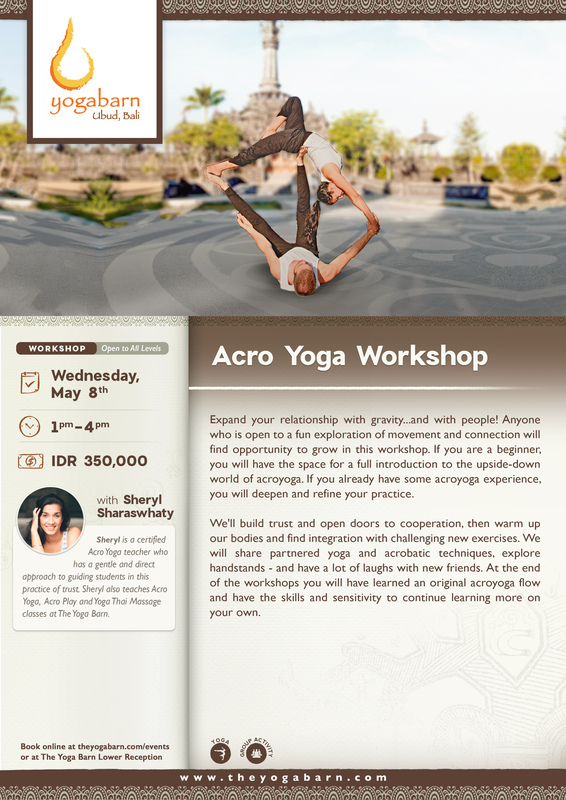 If you are a beginner, you will have the space for a full introduction to the upside-down world of acroyoga. 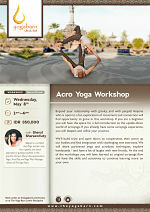 If you already have some acroyoga experience, you will deepen and refine your practice. We'll build trust and open doors to cooperation, then warm up our bodies and find integration with challenging new exercises. We will share partnered yoga and acrobatic techniques, explore handstands - and have a lot of laughs with new friends. At the end of the workshops you will have learned an original acroyoga flow and have the skills and sensitivity to continue learning more on your own. The use of blocks, blankets, bolsters and straps to your asana practice are meant to support the body into deepening into the posture. Do you know when and how to call these into your practice in a beneficial way? Or are you literally propping yourself up by dumping into these tools? 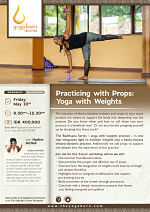 The BadAsana Series – yoga with weights practice – is one that integrates light to medium weights into a hatha-vinyasa infused dynamic practice. Additionally, we add props to support and deepen into the experience of this practice. 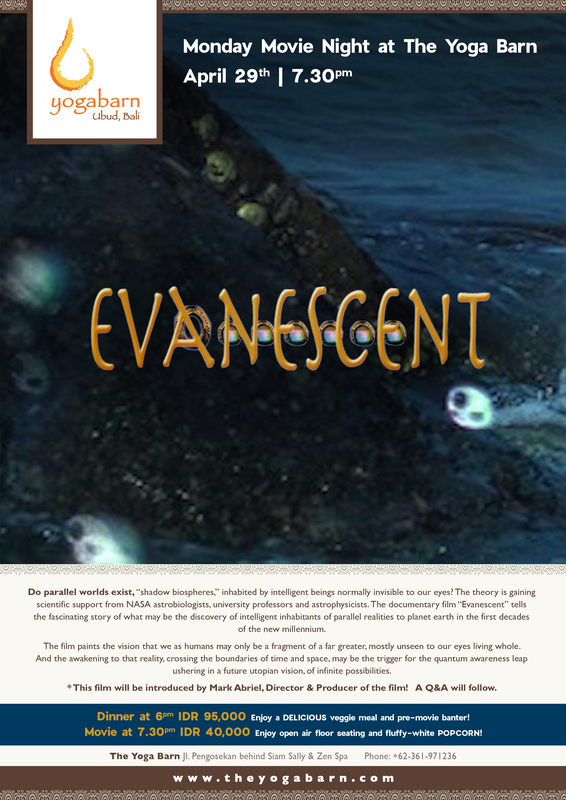 · Conclude with a deeply restorative savasana that leaves you feeling energized and uplifted. Nadine McNeil's twenty-odd year career within the United Nations, serving at location across the globe, is what guided her toward yoga, primarily as a necessary tool for self-care while serving in volatile, conflict scenarios. Her current mission includes designing and implementing a yoga module that especially supports those who tirelessly serve others through their daily work. The more we move, the more we invite openness, strength, mobility, and creativity into our body. And the more consciously we move, the more integrity and healthy movement patterns we create. Join Chris Fox for a workshop of creative movement in forms of moving our spine more freely, exploring intrinsic and animalistic movement, task-based exploration, learning how to move actively to strengthen and protect our joints, and find creativity within our body to explore what is inherently ours - freedom of movement. The more you connect to your body, inviting both control and surrender, your breath will become more free and flowing, and with a deeper connection between body, mind and breath, we delve deeper into a connection to the higher Self, as the path to consciousness moves through the body. So, let us go on a journey of movement, from our primal Self to our creative Self, and welcome connection to our Higher Self! 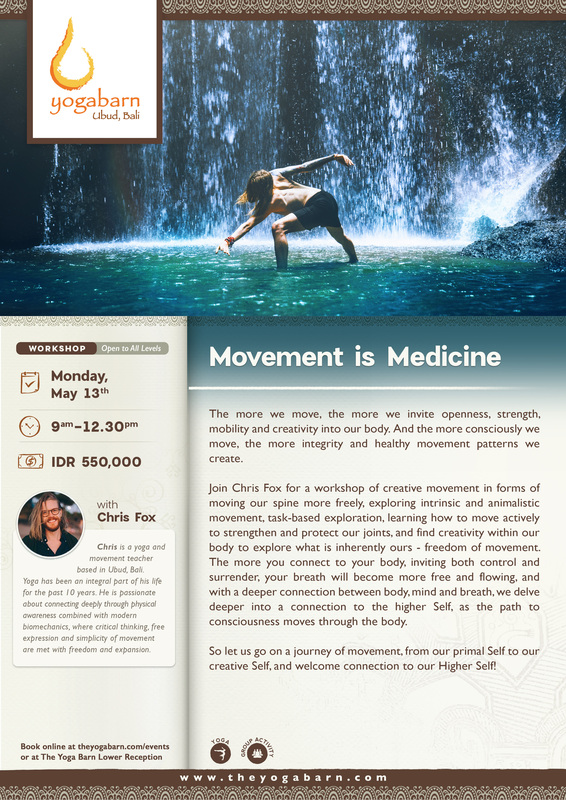 Chris Fox is a yoga and movement teacher that has a strong passion for individual expression, deep connection to physical awareness, combining yoga asana with modern biomechanics and deconstructing movement patterns, where critical thinking and simplicity of movement are met with freedom and expansion. Yoga is a massive part of his life, where he invites creativity, embodied movement, and personal uniqueness to open up the pathways to your true self-expression, and he is dedicated to share his love for yoga and movement in a vibrant and unique way. 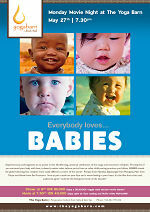 Every child born on Earth is conditioned by his or her experiences, parents, and upbringing. All of us suffer pain, and most of us experience some form of actual trauma, at various points in our lives. Far more than just physical exercises, Yoga is, in fact, the Highest Form of Psychology. 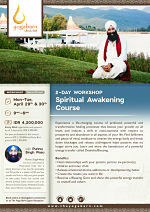 Satyatma began his spiritual path with a spontaneous and extremely powerful Kundalini Awakening in 1995. 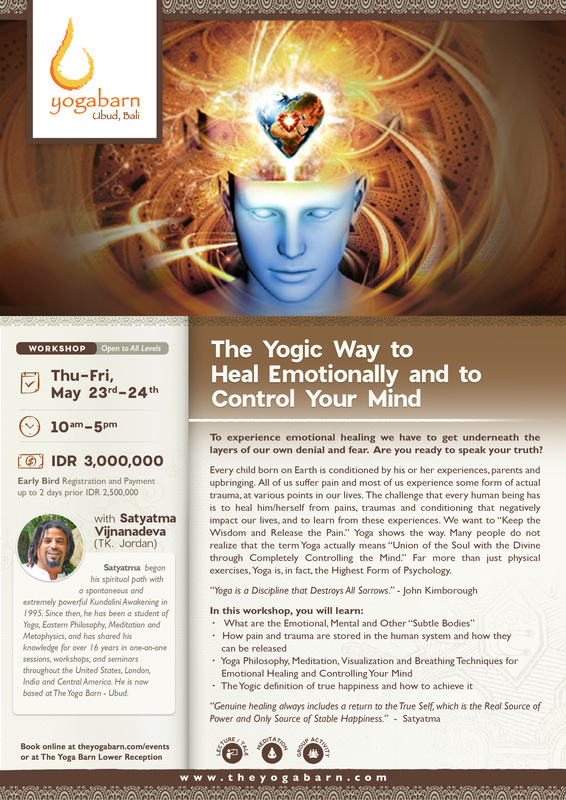 Since then, he has been a student of Yoga, Eastern Philosophy, Meditation, and Metaphysics, and has shared his knowledge for over 16 years in one-on-one sessions, workshops, and seminars throughout the United States, London, India and Central America, and is now based at The Yoga Barn - Ubud. Hands-on adjustments are very powerful tool for yoga teachers. When done well, hands-on adjustments are an opportunity to retrain patterns or ways of moving that we see in our yoga students. In this Workshop you will understand the big picture of why, when, and how to apply hands-on adjustments, while learning skills that can be applied to all styles of yoga asana practice and “real-world” bodies (including differences in height, flexibility, strength, and level of practice). These skills go a long way in building the relationship that you have with your students and instilling trust. - Why do we do physical adjustments in yoga? - Is it ok to put my hands on someone? - What makes a good adjustment? - Where should I, the teacher place my body? - What adjustment is appropriate for this student? - How do I judge the amount of pressure I use? Jose was originally trained in Tai Chi and Iyengar yoga, and explored different yoga styles worldwide. He lived 5 years in India where he opened his own yoga studio and deepened in his spiritual practice. Jose sees teaching as a service – he strives to spread awareness of the importance of spinal decompression and alignment of the body (to relieve stress, treat injuries and improve any physical practice) as well as the workings of the mind. His classes are fun, challenging and spiritually uplifting. 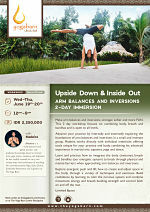 Make arm balances and inversions, stronger, softer and more FUN. This 2-day workshop focuses on combining body, breath and bandhas and is open to all levels. Advance your practice by internally and externally exploring the foundations of arm balances and inversions in a small and intimate group. Madeira works directly with individual intentions offering tools unique for your practice and body, combining his advanced experience in martial arts, capoeira, yoga and dance. Learn and practice how to integrate the body (anatomy), breath and bandhas (our energetic system) to break through physical and mental barriers when approaching arm balances and inversions. through variety of techniques and exercises. Explore energetic push and lift, how to create and adjust space in the body through variety of techniques and exercises. Build confidence by learning to calm the nervous system and combine movement, energy and breath to build strength and control both on and off the mat. 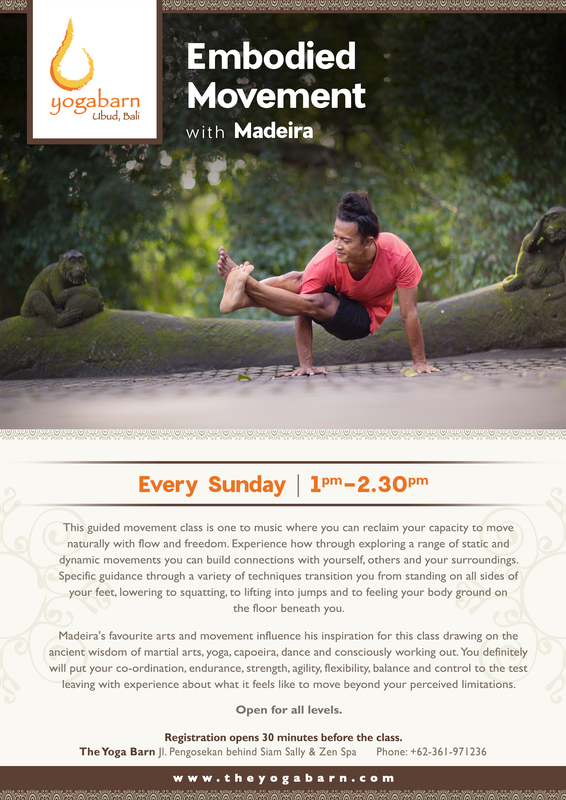 Madeira is a multi-talented and gifted teacher with profound knowledge based in martial arts, yoga, dance, anatomy and Capoeira, he has craftily created his very own unique ways and techniques of teaching. He currently teaches Yoga, Salsa Dance, Embodied Movement and Capoeira at The Yoga Barn. Theobroma cacao is the food of the Gods. A historically-revered plant food which is now much overlooked and misunderstood. In more familiar terms it is known as chocolate. 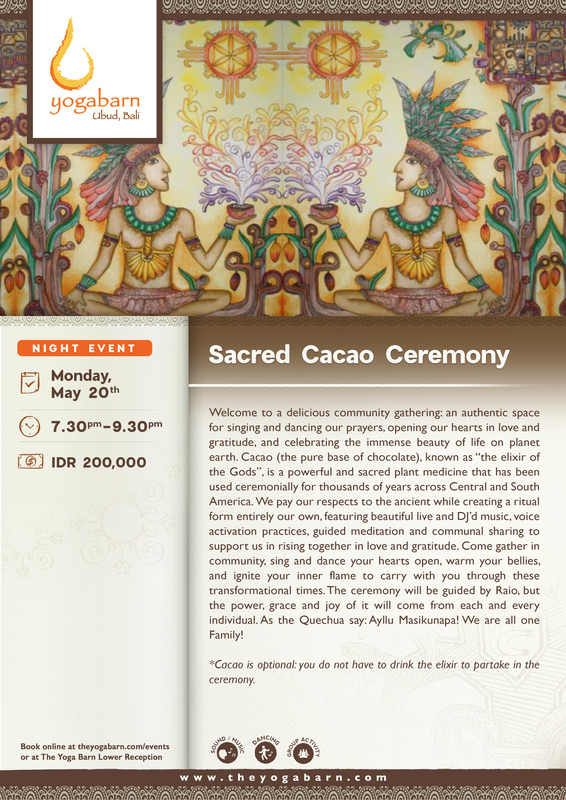 Levi’s Cacao Ceremonies combine the profound sacredness of ceremony with the equally profound deliciousness of arguably the most magical food on the planet. What’s not to like? Using ceremonial-grade cacao, which makes even most raw chocolate taste ordinary, you’ll experience the unique heart explosions that only cacao can bring channeling the wisdom of cacao spirit for deep, transformative realization. 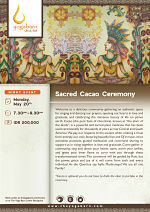 Every Cacao Ceremony is a collaboration between the co-participants, facilitated and woven together by Levi. Each one unfolds differently, although you can expect some or all of the following: yoga, meditation, singing, dancing, laughing, crying, hugging, and – undoubtedly - loving. Levi Banner M.A. 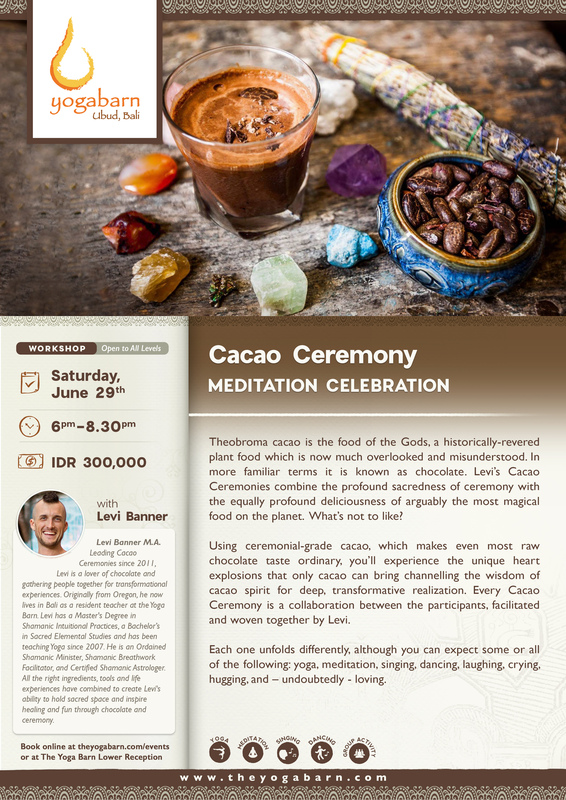 Leading Cacao Ceremonies since 2011, Levi is a lover of chocolate and gathering people together for transformational experiences. 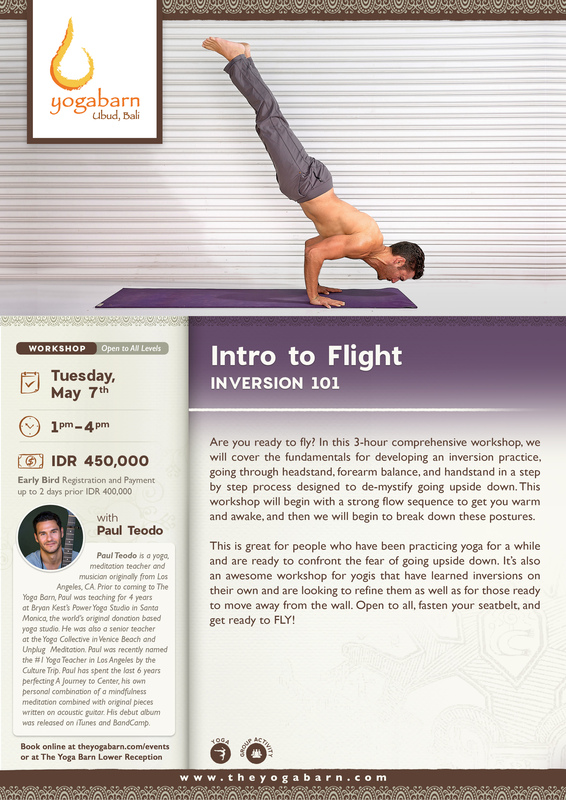 Originally from Oregon, he now lives in Bali as a resident teacher at the Yoga Barn. Levi has a Master's Degree in Shamanic Intuitional Practices, a Bachelor’s in Sacred Elemental Studies and has been teaching Yoga since 2007. He is an Ordained Shamanic Minister, Shamanic Breathwork Facilitator, and Certified Shamanic Astrologer. All the right ingredients, tools and life experiences have combined to create Levi's ability to hold sacred space and inspire healing and fun through chocolate and ceremony. Price include MFR kit and handouts. 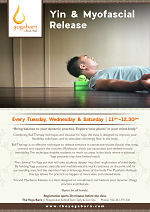 Learn a new and effective way to eliminate pain, improve flexibility, and to find balance in your practice! This could be the practice you didn’t know your body needs! Combining two powerful fascial (connective tissues) manipulation techniques: Myofascial Release (MFR) and Yin Yoga, this workshop offers a comprehensive, yet practical self-care approach on how to eliminate pain, improve ease of movement, and flexibility on the hips and lower back region. 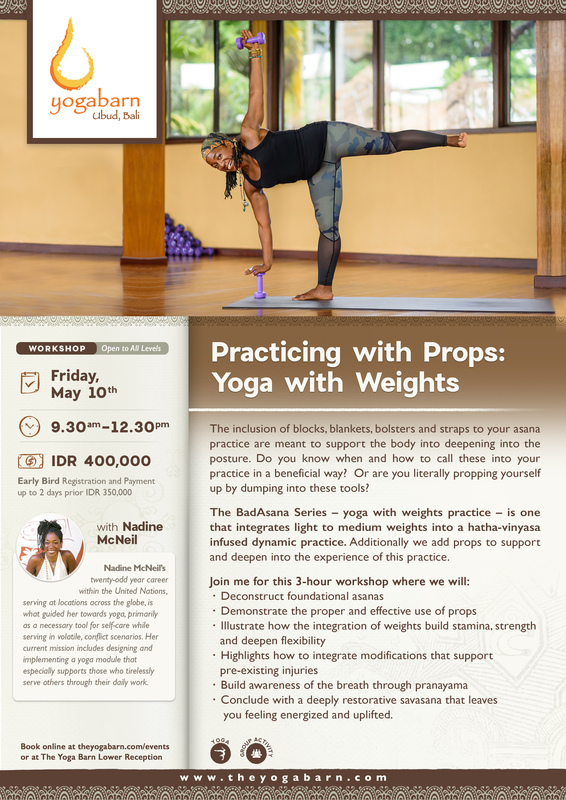 This workshop is designed for Yoga practitioners and non-practitioners, as well as general fitness enthusiasts. - Two hours of practice. Native Balinese, Eka, has been teaching Yoga locally and internationally for over 9 years. He is also an experienced Craniosacral therapist. He has a masters degree in media from Ohio University and the prestigious Fulbright scholarship in his pocket. His passion for fascial studies, Yin Yoga, and anatomy led him to study with Paul Griley’s (the founder of Yin Yoga) senior assistants: Jo Phee and Joe Barnet, as well as world-renown fascial expert Robert Schleip. In his free time Eka enjoys singing with his band, baking, and pondering about branching out to stand up comedy. From excessive computer & phone use, to one too many caturangga and weight trainings, to grief of a broken heart. Our neck, shoulders, and upper back endure a heavy amount stress every day, causing tensions and pain in the body. Combining two powerful fascial (connective tissues) manipulation techniques: Myofascial Release (MFR) and Yin Yoga, this workshop offers a comprehensive, yet practical self-care approach on how to maintain health, improve flexibility, and to eliminate pain from our neck, shoulders and upper back region. 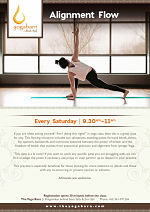 This workshop is designed for Yoga practitioners and non-practitioners, as well as general fitness enthusiasts. ⁃ Two hours of practice. 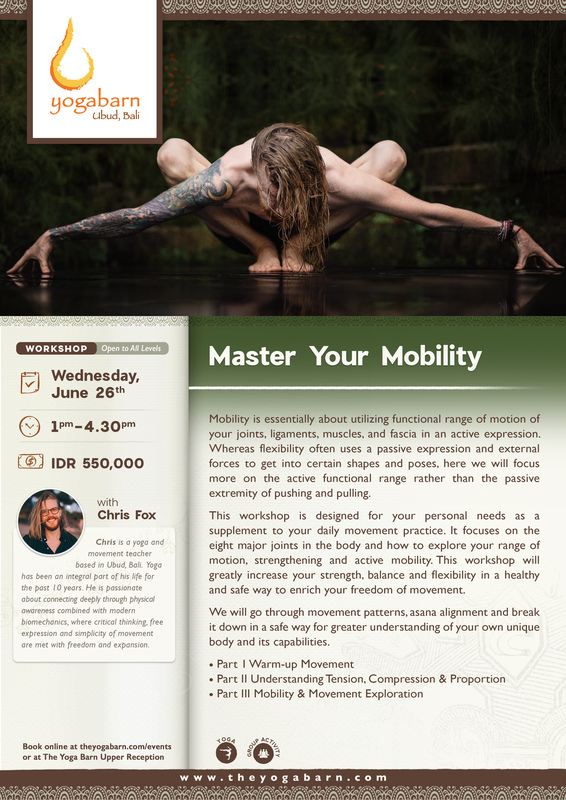 Module three of our Myofacial Release (MFR) and Yin Yoga workshop series would guide you deeper in exploring the interconnectivity of our extremities (legs and arms) with other parts of the body. We’ll discover how tensions on your feet might cause you lower back pain. How we can improve shoulders flexibility with a simple tension release on the arms, and much more. This comprehensive self-care workshop is designed for Yoga practitioners and non-practitioners, as well as general fitness enthusiasts. Tibetan Bowls have been used since ancient times to invoke sacred spaces for meditation, healings and spiritual rituals. In this sound meditation session with Wakuha, you will enter a deep meditative state induced by therapeutic tones of the bowls. Time and space diminishes while you relax and experience deep peace and stillness within. 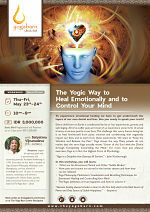 With the expansion of consciousness, your mind, body, emotions and spirit will heal effortlessly. Wakuha is an acclaimed spiritual guide with extensive experience in helping clients with their spiritual journeys since 2009. She has also been offering healing sessions at the Yoga Barn since 2011. Many have been touched by the light and energy brought by Wakuha and have been deeply transformed. Be enlightened by the Wakuha experience as she shares her unique and special gifts. In Person event registration opens 1 hour prior to event at The Yoga Barn Lower Reception. Children under the age of 12 are not permitted to join Night Events. an immersion into a “spiraling cocoon of total sound”. The Gong creates a sense of ecstasy and well-being as energy blockages are released on the cellular levels, allowing the body system to function more efficiently. In this sound dimension the “normal” relationship between the body and the ego (mind) is dissolved so the gong frequency penetrates the body in a certain way, like a code, to rebalance the nervous system, strengthen the immune system and work on healing inner pathways. The powerful vibrations of the Gong Bath Meditation leaves guests in a healing state, often physical and emotional releases are experienced. Kirtan is a practice that quiets the mind and opens the heart. Singing in a call-and-response style, ecstasy and inner illumination are invoked. Using ancient Sanskrit mantras, kirtan calls upon sacred energies which help to remove obstacles and bring us to the center of our being. When we chant, breathe and move to the same melodies and rhythms our vibrations begin to synchronize for our own health and well being, and benefit the whole world. Kirtan or 'Bhakti Yoga' (Devotional Yoga) is a very different kind of music. Based on ancient chants, it has the ability to quiet the mind if listened to with intention. Everyone experiences kirtan differently, it doesn't have to be a religious experience. You can think of it as a community gathering that uplifts the heart in song. Masikunapa! We are all one Family! - Dinner at 6.00 PM – 8.00 PM IDR 95,000, enjoy a delicious fish & veggie meal! - Movie at 7.30 PM IDR 40,000, popcorn free! Do parallel worlds exist, “shadow biospheres,” inhabited by intelligent beings normally invisible to our eyes? The theory is gaining scientific support from NASA astrobiologists, university professors and astrophysicists. The film paints the vision that we as humans may only be a fragment of a far greater, mostly unseen to our eyes living whole. And the awakening to that reality, crossing the boundaries of time and space, may be the trigger for the quantum awareness leap ushering in a future utopian vision, of infinite possibilities. Levi will guide you in an ecstatic dance journey through the 5 elements. You will shape-shift your body, moving in new ways, seeing new parts of yourself and remembering forgotten parts. During the dance there will only be body language and no spoken words - only the guidance of the facilitator and your free form movements and primal expression. You will go deep into the dance and lose the distractions of your mind, playfully releasing any stuck energy and embracing your natural essence. We are made of the elements so through the dance we embody the elements! Once we have moved through the entire journey, we will come back together in circle to close the ceremonial container. We will share in community and togetherness, leaving you with a sense of beauty and fulfillment in your heart. Though cacao is not an aggressive plant medicine and our blend is quite delicious, it is still not required for you to drink the chocolate at all. 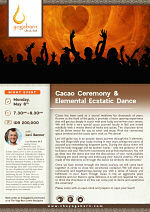 You can come just to dance and experience the ceremony! Levi Banner M.A. 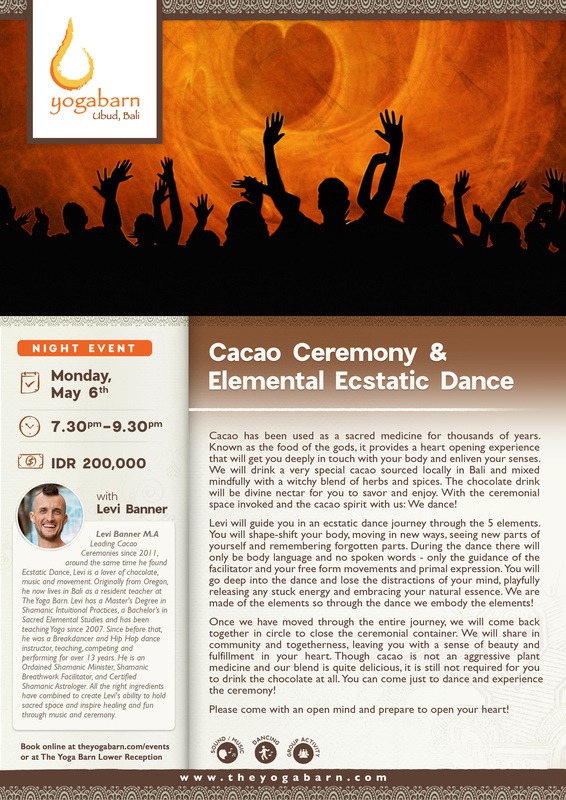 Leading Cacao Ceremonies since 2011, around the same time he found Ecstatic Dance, Levi is a lover of chocolate, music and movement. Originally from Oregon, he now lives in Bali as a resident teacher at the Yoga Barn. 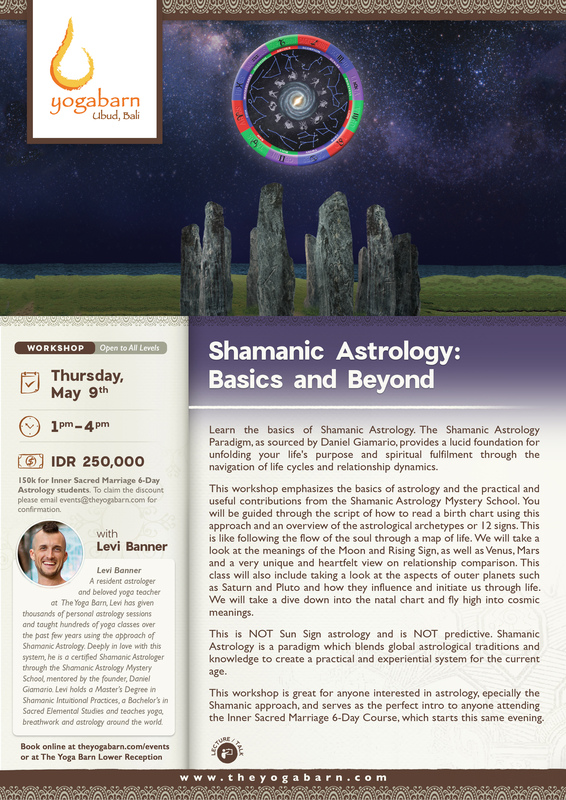 Levi has a Master's Degree in Shamanic Intuitional Practices, a Bachelor’s in Sacred Elemental Studies and has been teaching Yoga since 2007. Since before that, he was a Breakdancer and Hip Hop dance instructor, teaching, competing and performing for over 13 years. He is an Ordained Shamanic Minister, Shamanic Breathwork Facilitator, and Certified Shamanic Astrologer. All the right ingredients have combined to create Levi's ability to hold sacred space and inspire healing and fun through music and ceremony. 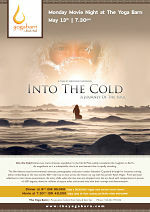 Into the Cold follows two men’s dramatic expedition to the North Pole, widely considered the toughest on Earth. As magnificent as it is inhospitable, this is an environment that is rapidly vanishing. 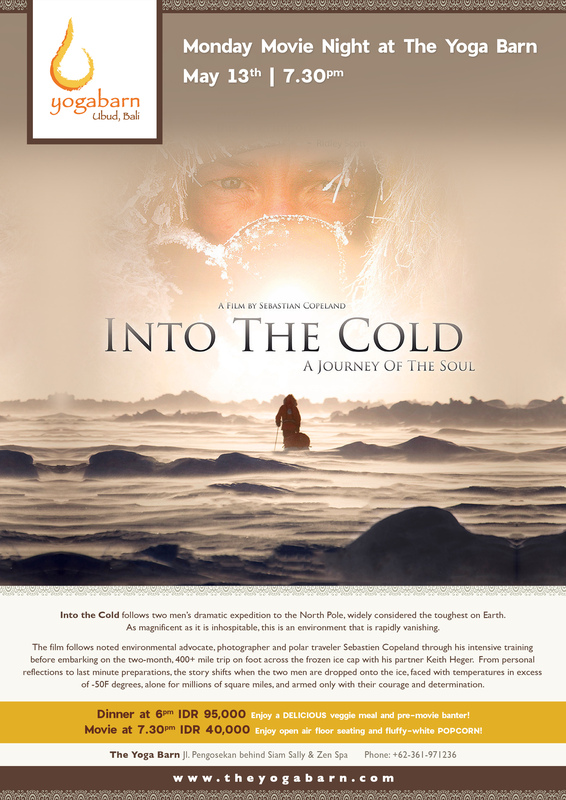 The film follows noted environmental advocate, photographer and polar traveler Sebastien Copeland through his intensive training before embarking on the two-month, 400+ mile trip on foot across the frozen ice cap with his partner Keith Heger. From personal reflections to last minute preparations, the story shifts when the two men are dropped onto the ice, faced with temperatures in excess of -50F degrees, alone for millions of square miles, and armed only with their courage and determination. Monday Movie Night: Everybody Loves… BABIES! The ancient sound of Tibetan Singing Bowls have the ability to induce an immediate deeply meditative state. This powerful music therapy relaxes both body and mind from stress and tension. The vibration of the Tibetan Bowls is designed to clear and balance one’s chakra. First come, first served. Once the class begins the doors remain closed in order to avoid disturbing the meditation. 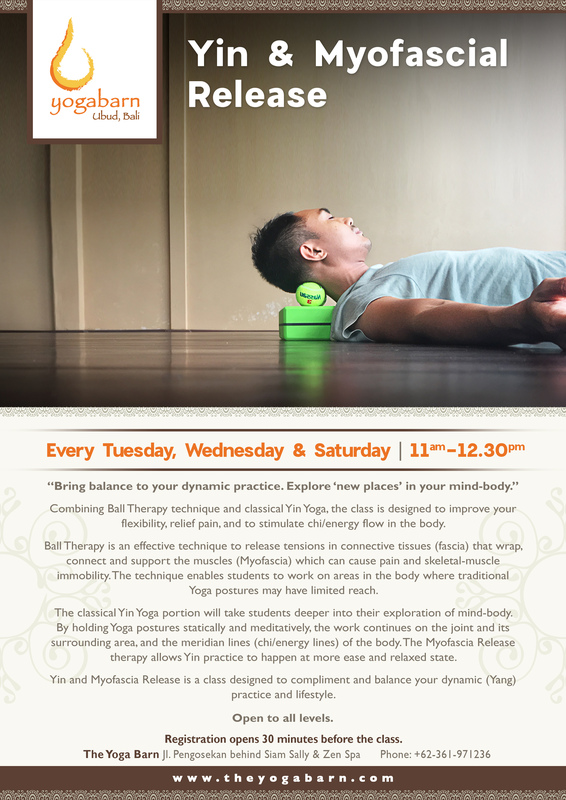 Combining Ball Therapy technique and classical Yin Yoga, the class is designed to improve your flexibility, relief pain, and to stimulate chi/energy flow in the body. Ball Therapy is an effective technique to release tensions in connective tissues (fascia) that wrap, connect and support the muscles (Myofascia) which can cause pain and skeletal-muscle immobility. The technique enables students to work on areas in the body where traditional Yoga postures may have limited reach. The classical Yin Yoga portion will take students deeper into their exploration of mind-body. By holding Yoga postures statically and meditatively, the work continues on the joint and its surrounding area, and the meridian lines (chi/energy lines) of the body. The Myofascia Release therapy allows Yin practice to happen at more ease and relaxed state. Yin and Myofascia Release is a class designed to complement and balance your dynamic (Yang) practice and lifestyle. open to all levels. Sound Healing is a profound and powerful experience of sound and vibration, which combines live music, pure natural sound, ancient mantras & soulful vocals. Sound has been utilised in various cultures for thousands of years as a tool for the body, mind and soul of a person for harmony and healing. You can lie comfortably on mats on the floor while slowing down your breathing. By doing this, you prepare yourself to get in a meditative state of stillness and become the receiver of sounds. You receive powerful mantras, sound medicine melodies and other different songs accompanied by sacred instruments in order to move in a place of complete relaxation and peace. 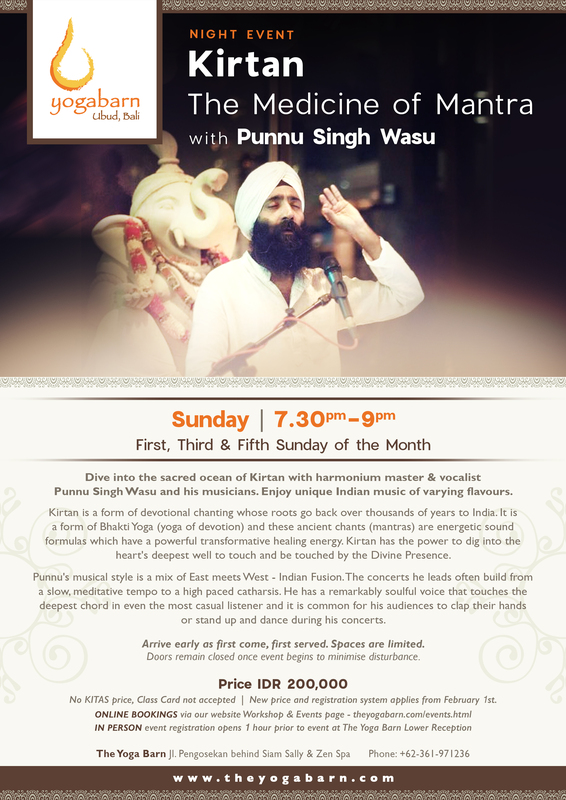 Punnu Singh Wasu is an Indian vocalist, musician, songwriter and multi instrumentalist. He was born and raised in Hyderabad, India into a family that has a true love for Kirtan and spirituality. He began studying the harmonium and singing at the tender age of 5. At age 10, Punnu moved on to learning the Indian Classical Music (Hindustani) while traveling with his father throughout India singing the beautiful verses of Kirtan. Later on his knowledge of mandolin and tabla became his focal point. Nowadays he performs Kirtan, Xtatic Kirtan, Indian Fusion, Indian Classical music, Sufi, Bollywood music as well as Sound Healing around the world. He has his own Kirtan Academy and also leads music workshops in combination with yoga & meditation. 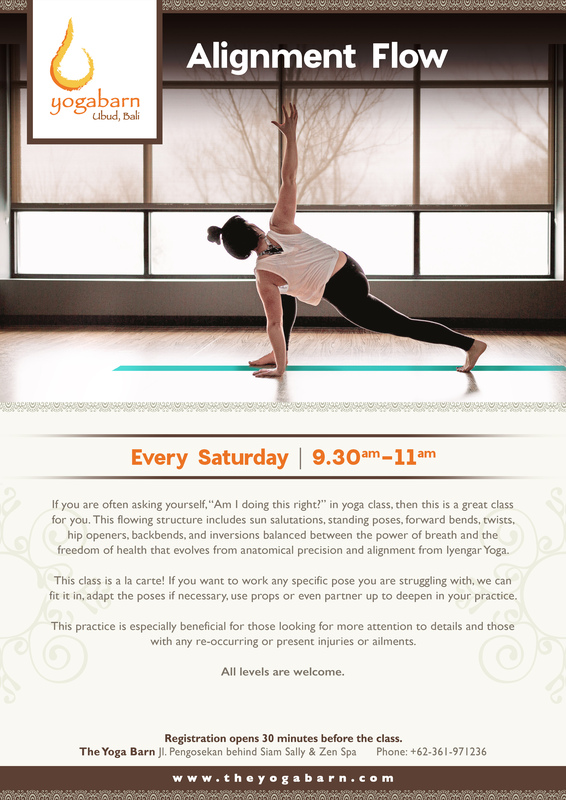 If you are often asking yourself, “Am I doing this right?” in yoga class, then this is a great class for you. This flowing structure includes sun salutations, standing poses, forward bends, twists, hip openers, backbends, and inversions balanced between the power of breath and the freedom of health that evolves from anatomical precision and alignment from Iyengar Yoga. This class is a la carte! If you want to work any specific pose you are struggling with, we can fit it in, adapt the poses if necessary, use Props or even Partner up to deepen in your practice. This practice is especially beneficial for those looking for more attention to details and those with any re-occurring or present injuries or ailments. 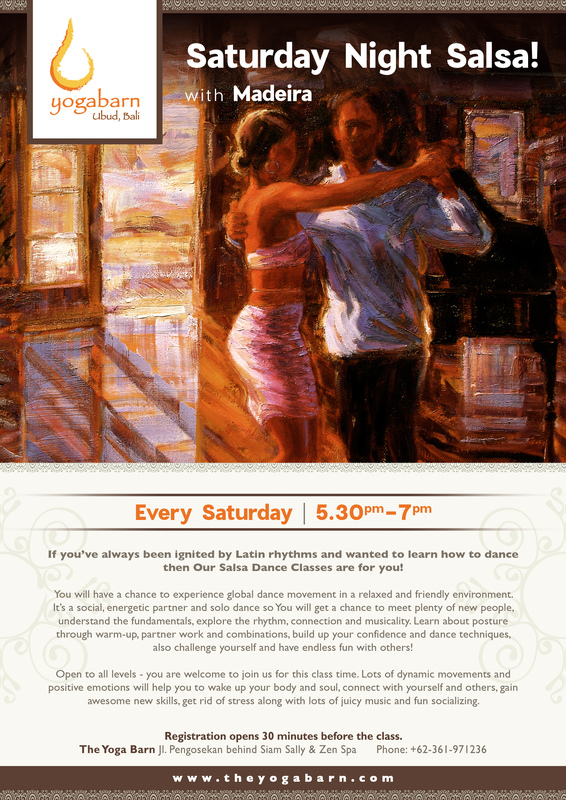 If you’ve always been ignited by Latin rhythms and wanted to learn how to dance then Our Salsa Dance Classes are for you! You will have a chance to experience global dance movement in a relaxed and friendly environment. It’s a social, energetic partner and solo dance so You will get a chance to meet plenty of new people, understand the fundamentals, explore the rhythm, connection and musicality. Learn about posture through warm-up, partner work and combinations, build up your confidence and dance techniques, also challenge yourself and have endless fun with others! Open to all levels - you are welcome to join us for this class time. Lots of dynamic movements and positive emotions will help you to wake up your body and soul, connect with yourself and others, gain awesome skills, get rid of stress along with lots of juicy music and fun socializing. It’s a guided fun class, where you reclaim your capacity to move naturally with flow and freedom. Build a connection with yourself, others and your surroundings. Explore all range of static and dynamic movements, practices and techniques. Experience and learn all from gentle to tough, involving body, mind and spirit into all kinds devotional practices including the ancient wisdom of martial arts, yoga, capoeira, dance, conscious workout etc. Gain Coordination, Endurance, Strength, Agility, Flexibility, Balance, and Control. Improve your adaptability and body awareness. Develop your own ultimate movement journey based on your goals and dreams. Free yourself from limitations.